Bangkok (Thailand) – March 27, 2018 (travelindex.com) – Maserati Thailand partners with Italy’s renowned fashion brand Ermenegildo Zegna in presenting silk interior in the finest tradition of craftsmanship for the “Ghibli Granlusso” being showcased along with 6 other models at the 39th Bangkok International Motor Show 2018. Piyathep Siwakas, General Manager of Maserati Thailand under Master Group Corporation (Asia) Co., Ltd. (MGC-Asia) said that ‘Following the successful launch of the Spring Summer 2017 Collection and the unveiling of the ‘Quattroporte Ermenegildo Zegna Limited Edition’, Maserati has once again collaborated with the renowned fashion brand ‘Ermenegildo Zegna’, producer of some of the world’s most beautiful fabrics since 1910. In order to enhance the interior of the ‘Ghibli GranLusso’ with 100% natural fibre mulberry silk inserts on the seats, door panels, roof lining, sunshades and ceiling light fixture. The silk, always anthracite in colour, can be combined with three different shades of luxurious fine leather: black, tan, or red. The Ghibli GranLusso reinterprets the concept of luxury in a sports sedan by enhancing the exterior finish and improving on-board comfort for both driver and passengers. The front console, the front and back door interiors as well as the steering wheel are covered with 100% real Italian leather. “This collaboration brings together two brands known for their commitment to nothing-but-the-best quality and manufacturing expertise together to create such a luxurious elegance and race-bred performance unique to Maserati, said Mr. Piyathep. 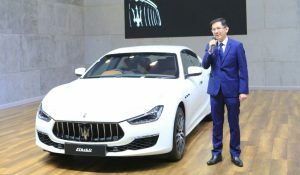 The 2018 Maserati Ghibli available in the Thai market is offered in both petrol and diesel models and has four configurations comprising the twin-turbo 3.0-litre V-6 Ghibli GranLusso with 300 HP, Ghibli S GranSport with the same engine displacement but with 430 HP, Ghibli Diesel fitted with turbocharged 3.0-liter V-6 engine, rated at 275 HP and 600 Nm of torque at 2,000-2,600 rpm. Last one is the Ghibili Diesel GranLusso which comes with many additional innovative options. Every Ghibli sports sedan is rear-wheel drive via ZF 8-speed transmission. Faithful to its DNA, the new Ghibli range offers unmistakable class, top-quality performance and a stylish yet comfortable driving experience. First SUV in the history of Maserati. Distinctive exterior makes it stands out from the crowd. Hand-crafted interior creates a sense of occasion. At last performance is never neglected since the diesel engine produces 275 hp and amazingly 600 Nm of torque. Passengers travel in an utmost ride comfort via the 6-level adjustable air suspension. Luxury SUV that can make your heart beat faster. Petrol V6 3.0-litre powerhouse provides 430 hp at your disposal. Interior is equipped with sport seats and carbon fibre trim. Optimum performance, on or off-road is guaranteed via Q4 all-wheel drive and torque vectoring which cleverly distribute the torque to each wheel independently. High luxury sports sedan with 50 years of heritage. The 6th generation is a perfect combination between luxury and sportiness. Both petrol or diesel engines are available as well as hand-crafted interior and other futuristic driving aids ensuring safety and comfort wherever you go. 4-seater sport GT ideal for everyday use. Beautifully designed with agility in mind. Grand powerhouse is essential and this is where the petrol V8 4.7-litre engine comes in. Providing 460 hp, passengers are in for an exuberance experience with maximum comfort from the hand-crafted interior. 4-seater Sport GT convertible that is suitable for everyday use. Top performance is guaranteed via 460 hp engine, clocking 0-100 km/h in 5 seconds. Plus total comfort of the luxurious interior. Motor Show from until 8 April 2018 at Booth A05 Challenger 3, Impact Arena Muang Thong Thani. Maserati produces a full range of unique motor cars immediately recognisable for their extraordinary personality. Thanks to their style, technology and innate exclusivity, they satisfy the most exacting, refined tastes and are a constant point of reference in the automobile industry. The current line-up includes the flagship Quattroporte executive sedan, the Ghibli sports sedan, the Levante ‘Maserati of SUVs’ and the sporty GranTurismo and GranCabrio. The range has never been more complete, offering a choice of petrol and diesel engines, rear- or four-wheel drive, a selection of sophisticated materials and outstanding technical solutions. With its tradition of successful automobiles, Maserati continues to redefine the concept of Italian sports motoring on an ongoing basis through design, performance, comfort, elegance and safety.